They might have stood out as the underdogs in a nomination list made up of Africa’s heavy hitters at the Channel O Music Video Awards in 2013, but Zone Fam had everything under ‘Contolola’ at the end of the day as they would say. Zone Fam has put in mad work to ensure Zambia solidifies a place in rap’s history books. In 2013 alone they had number one singles like ‘Sinjonjo’, ‘Lobola’ and ‘Propeller’ all over different parts of Africa. Their latest award-winning track ‘Contolola’ had its accompanying music video occupy top places on both the MTVBase and Channel O music charts, and in February last year they took home Best Collaboration for their song ‘Vigabenga’ which featured Ruff Kid, Slap Dee and Pjay. Their current videos maintaining top positions on charts around Africa include ‘Translate’, ‘Jus Ride’ with CampMulla and ‘Da Bidness’. 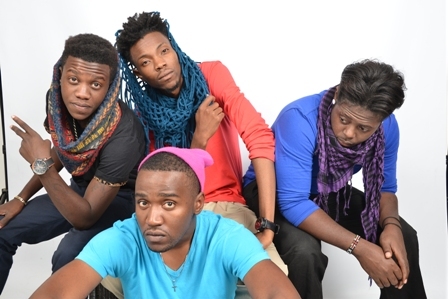 We caught up with Zambia’s own to fill us in on their journey and where their music is headed. HYPE: Take us through the formation of Zone Fam and have the goals which you outlined in the beginning been fulfilled? Zone Fam: Zone Fam was formed in 2007 when we all met at this studio called ‘The Zone’. We’d started out as solo artists and eventually became a family, hence the name of the group. Music was a hobby around that time but in 2009 we released our first mixtape The Full Script with Teckzilla. In 2011 our first major hit was ‘Shaka Zulu On Em’ which got us wide recognition and made us focus on building our career to make sure our music was heard across Africa and the globe. So far we have managed to get continental attention and our biggest hit thus far has been ‘Contolola’ off our yet to be released album; we are still working hard to get even further recognition and widen our listenership. Take us through your journey hustling to make it in Zambia and what’s the reception been like from your fellow citizens? The journey has been a long and eventful one. Like DMX said: “…been through mad different phases.” We started off by taking part in ciphers and dropping mixtapes and singles every other day. We rapped in English but realised we got a better reception locally when we mixed English with different dialects. 2011 was our breakout year, apart from ‘Shaka Zulu On Em’ – we worked on our first album and songs such as ‘Chikali’ and ‘Mbama’ remain embedded in Zambian hip hop and music history. The reception has been great and we thank our fan base that has grown over the years for keeping us on our toes. ‘Contolola’ debuted on BET’s 106 and Park in 2012. Tell us how that happened and what this meant to your movement? We first released the song on 1 September and the music video debuted on MTVBase on 24 October that same year, going to number one on the Afribizcharts in November. A content manager at BET got a hold of it and we got the message that it was going to premiere on 106 and Park which was a proud moment. We were listed alongside big timers such as Ice Prince and Teargas and that was a humbling experience. What went through your minds when your name was called out for the Channel O Africa Music Video Award and how has life been since winning the award in the Most Gifted Duo/Group/Featuring category? A lot went through our minds, including mixed emotions. We were all excited and surprised to an extent. We also drew a blank at some point but we owe it all to the fans, their relentlessness and consistency. Since winning the award it has been busy, but it’s back to work because we have to keep giving the fans that music that they have grown to love. What hardships have you had to endure to get to where you are right now and what are the lessons you’ve taken away from those experiences? There have been a number of them, from financial challenges to group dynamics. What we have learned is friendship before business – we are friends first and the business side comes afterwards. We always plan our work together and discuss any issues that might arise. Make music for the masses and know your target market at a particular time. Try something new always. We are currently working on our second album that will be released soon. We are also looking forward to exploring more options and hopefully touring Africa in the near future. We want to collaborate with more artists on the continent. Any advice to upcoming artists out there on how to impact on the game? The best advice we can give is first to have belief in yourself, always work on your craft and invest in it. Drop consistent material and value your fan base. Always remember those people who helped you along the way and build a network that forms into a support system.